will be shown at NorthArt from 16 June to 3 July. 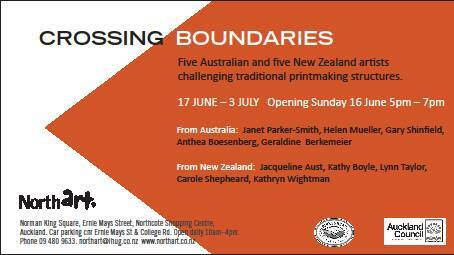 who push the known boundaries of printmaking. Lynne Taylor, Carole Shepheard and Kathryn Wightman. a means by which the artist can produce multiple, identical two dimensional prints. The proposed exhibition will challenge this view of printmaking. of opportunities and possibilities for creative expression. the domain of the painter or sculptor. print installations, new technologies, three dimensional forms, and alternative supports." on Saturday 15 June 2013 from 11am-3pm. to make a small original print using the simple, quick technique of drypoint etching. Drypoint involves scratching a design into plastic using etching needles. and the image is transferred to paper when passed through an etching press. no experience is needed and it is suitable for all ages, so come along and give it a go. Northart, Ernie Mays Street, Northcote Shopping Centre, North Shore, Auckland.